A devastating disease, feline AIDS attacks a cat's immune system leaving it vulnerable to infections and other diseases that generally become fatal. Learn about the stages of feline immunodeficiency and how a vaccine can help prevent it. Feline immunodeficiency, commonly referred to as FIV or feline AIDS, is a viral infection that destroys a cat's ability to fight off infections and other diseases that attack its body. As the feline's immune system becomes weakened and is ultimately destroyed, the cat generally succumbs to its secondary illnesses. Many cats are able to live in relatively good health with FIV for as long as ten years before entering the terminal stage of their illness. Although there currently is not a cure for this horrible illness, there is a preventative vaccine available. Acute - The first stage of the infection occurs four to six weeks after the cat is initially infected. During this stage the cat may experience a slight fever lasting for a few days. Its lymph nodes become swollen for several days to several weeks, and there is a decrease in the count of white cells. There is the possibility of diarrhea or anemia during this time. Once this stage ends, the symptoms disappear and the second stage begins. Latent or Asymptomatic - During the second stage of infection, known as the subclinical phase, the cat tests positive for the FIV virus. During this stage there are not any symptoms present, and the cat often appears healthy. Although this dormant phase of the virus may only last months for some felines, there are others that stay in the latent stages of FIV for years before progressing to the chronic stage. Some cats testing FIV positive live to 12 to 15 years old. Others die from causes other then FIV before entering the chronic stage of the infection. Chronic - During the third stage of FIV, known as the terminal stage, the cat's immune system is unable to successfully fight off infections and diseases. The virus eventually depresses the immune system completely. Most cats, if not humanely euthanized during the chronic infection stage, die within one year of becoming terminally ill. The FIV virus cannot be spread to humans or other types of animals. It can only be spread from cat to cat. FIV is transmitted through a cat's saliva, blood or cerebrospinal fluid most often from bite or scratch wounds. 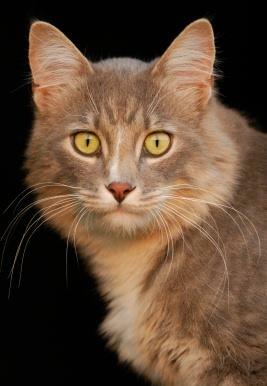 At greatest risk for contracting feline AIDS are male cats that are unneutered and allowed to roam freely outdoors fighting for territory and mating.It is possible, although relatively rare, for female cats that are FIV positive to pass the virus to their kittens. This occurs as the kitten passes through the birth canal or if the kitten ingests mother's milk that is infected with the virus. If a kitten tests positive, it should be retested at four and six months old before a final diagnosis is made. This is because kittens carry FIV antibodies received in their mother's milk and will be negative for the virus once the antibodies are completely out of their systems. In 2002, a new vaccine for FIV was developed and patented by the University of Florida and the University of California. The vaccine has been met with mixed feelings by cat communities throughout the United States. The one major drawback of the vaccine is that once a cat has been vaccinated, it will always test positive for the FIV virus. These test results have dire consequences for a vaccinated cat that becomes lost or ends up in an animal shelter for any reason. Most likely, the cat will be euthanized as an FIV positive cat. Another major issue concerning the vaccine is that it does not provide full protection against FIV. There are five FIV strains, and the vaccine only guards against two of them. Considering the devastating outcome of contracting the FIV virus, each cat owner must make the decision as to whether or not to vaccinate their cat for FIV. Feline AIDS is a devastating illness, but it is not a death sentence. With proper medical care, many FIV positive cats live long, happy lives.